I wrote a poem in 2012. 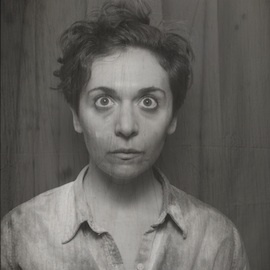 Lily Mooney is a writer, performer and teacher in Chicago. Since 2012, she has been an ensemble member of The Neo-Futurists, where she makes short plays for the company’s flagship show, The Infinite Wrench. She is the writer of many plays, including “the day that everyone else had tickets to see Purity Ring,” “Fake Vomit Contest (part two),” and “WHAT: Secret Meeting. WHEN: Right Now. WHERE: Your Armpits.” With Kurt Chiang, she co-creates and produces The Arrow, a experimental storytelling show that collides prose, plays, and improvisation. Other Neo-Futurist credits include Saturn Returns, (writer/performer) and The Neo-Futurists: Body (contributing writer). Mooney studied and performed improv at The Annoyance Theatre and holds an MFA from Northwestern University.